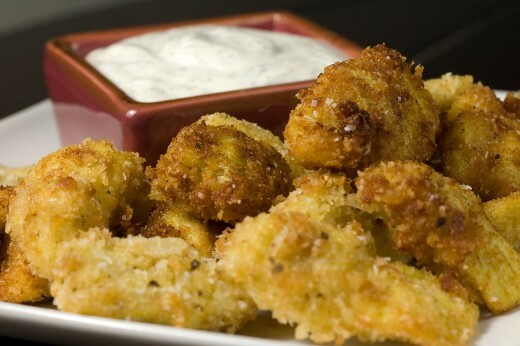 According to the California Pizza Kitchen website these appetizers are artichoke hearts fried with Japanese panko bread crumbs, then sprinkled with Parmesan cheese and it is served with a remoulade sauce. I've been seeing a lot of recipes calling for panko bread crumbs, so I went looking for them the other day at my local Walmart and found them on the shelf so I'm assuming they are a standard item throughout the country. The recipe below makes 4 servings. Heat about 1 inch of oil in a sauce pan over medium high heat. In a bowl beat the egg and set aside. In another bowl combine both bread crumbs, oregano, salt and pepper. Pat the artichoke hearts dry. Dip them in egg and then bread crumb mixture. Strain on paper towels to remove excess oil.